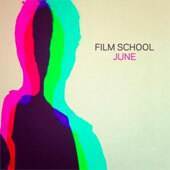 I really liked the output of San Francisco shoegaze act Film School, and was disappointed when they sort of faded away after the 2010 tour for Fission. I guess the band split up after that. But they have reformed for a few shows. And now they have a new EP out, which is an unexpected delight. This is a digital only EP of new material by the original band lineup. That means they are without bassist Lorelei Plotczyk, who, oddly enough is recommended to me as a connection every single time i log in to LinkedIn! Huh, she does internet content stuff now. Anyway, the band is moving on without her. And they do a fine job with it. There are four tracks on this EP. City Lights starts things off by reminding you of what made Film School so great: it's a noisy, swirling, psychedelic song with Greg Bertens’ voice lost in the haze. This is a classic shoegaze tune, and could have been on any of their previous records. Beautiful, if you like that sort of thing. The rhythm section amps it up for Give Up, bassist Justin Labo pounding out a rolling riff while drummer Ben Montesano keeps a metronomic beat. Keyboards and guitars clatter in the foreground, and Bertens is even more echoed here, his voice a floating haze. Another great tune. Waiting On a Cause tones down the shoegaze in favor or laconic psychedelic rock. Labo plays a great riff here, his bass keeping a head bopping beat as the guitars and keys play lightly, and Bertens signs quietly. Nice enough i guess, but not the shoegaze i listen to them for. But waiting On a Cause make sense when you get to June. This is a similar song but there is just a little more echo here, which suddenly makes that mellow psych rock sound like Spiritualized or early The Verve. They do this really well, the whole song building to a nice roaring echo. Good stuff. I continue to be impressed. I hope they keep at it.